In a climate of political urgency, artists have taken on the role of commentators, introspective poets and instigators of movement. 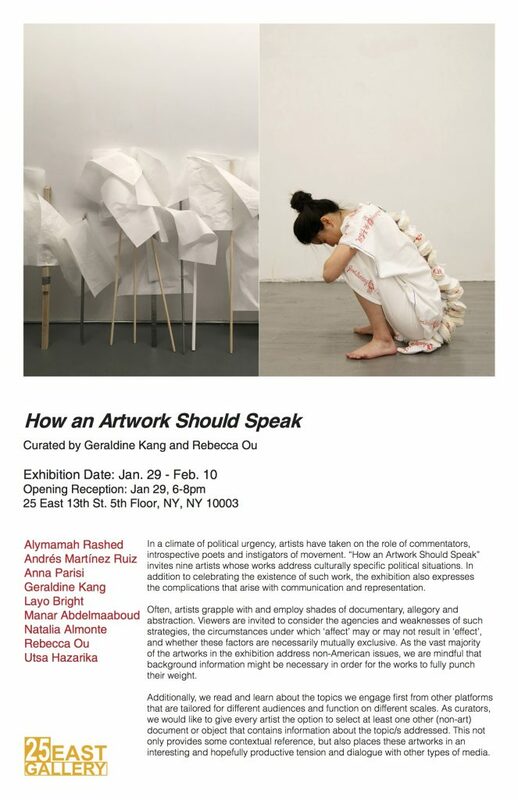 “How an Artwork Should Speak” invites nine artists whose works address culturally specific political situations. In addition to celebrating the existence of such work, the exhibition also expresses the complications that arise with communication and representation. Often, artists grapple with and employ shades of documentary, allegory and abstraction. Viewers are invited to consider the agencies and weaknesses of such strategies, the circumstances under which ‘affect’ may or may not result in ‘effect’, and whether these factors are necessarily mutually exclusive. As the vast majority of the artworks in the exhibition address non-American issues, we are mindful that background information might be necessary in order for the works to fully punch their weight. Additionally, we read and learn about the topics we engage first from other platforms that are tailored for different audiences and function on different scales. As curators, we would like to give every artist the option to select at least one other (non-art) document or object that contains information about the topic/s addressed. This not only provides some contextual reference, but also places these artworks in an interesting and hopefully productive tension and dialogue with other types of media.